If you have limited time on Capri but don't want to miss any of the island's most famous sights, then renting a scooter is an excellent option! Explore the island at your own pace, in total freedom and stress-free...especially during the months from April to October when non-resident vehicles are not allowed to embark for the island. It's easy to rent a scooter: as soon as you disembark at the Marina Grande port, you'll find a number of scooter rental agencies which offer services for those who want to strike out on two wheels. Together with a full tank of fuel and helmets, you will be supplied with an island map with the best routes and parking lots marked for an easy exploration of Capri. 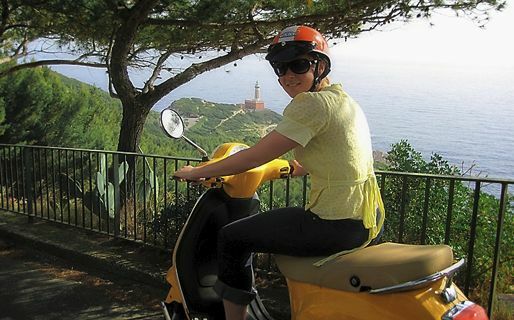 Nothing is more stress-free than booking your scooter in advance to explore Capri! Once you arrive on the island, you just need to hop and set out to all the most beautiful spots on the island. With Oasi Motor, you can book your scooter online now! And you're off: from Marina Grande, the only two roads lead to Capri town. At the Due Golfi roundabout, the main intersecton on the island, you can decide if you want to stop for a meander on foot through the picturesque lanes in the center of Capri town, or take the road towards Anacapri and Marina Piccola (which has traffic limits in the summer, and is closed for parking). If you have rented your scooter during the summer months, it's best to head to the beaches near Anacapri at the Punta Carena lighthouse and the Blue Grotto, taking the Provinciale Capri - Anacapri highway. You're sure to have fun navigating the curves of this scenic road which skirts the mountain slopes and offers a gorgeous view over the Gulf of Naples. After passing Piazza Vittoria, continue along Viale Tommaso de Tommaso to the intersection with Via Caprile and Via Pagliaro. Park in one of the public lots and take a stroll through the historic center of Anacapri (closed to traffic) and do some shopping along Via Giuseppe Orlandi, lined with churches and monuments. From Via Caprile, you can reach the Punta Carena lighthouse beach in just 10 minutes by scooter, where you can admire the sunset from the westernmost vantagepoint on the island. This is a great place to stop for a meal: the seaside Lido del Faro restaurant is specialized in fish and seafood, and perfect for a romantic dinner. Otherwise, the local favorite beachfront bar "da Antonio" is famous for its sandwiches and caponata for a light lunch. On your return trip from the lighthouse towards the center of Anacapri, it's worth a stop at the piazzola di Pino parking area to leave your scooter and visit one of the forts, which were once used to guard the waters surrounding the island. 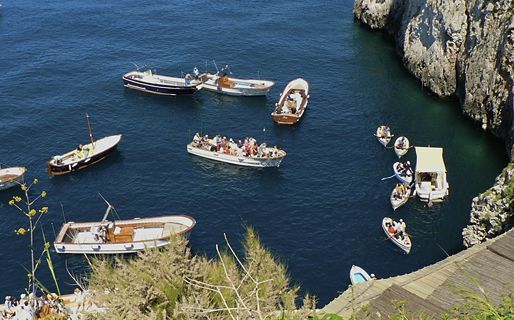 It's time to head to the Blue Grotto and board one of the tiny wooden row boats to visit the inside of this famous sea cave, or walk to the tiny rocky Gradola beach. Have a meal at Il Riccio, a traditional island restaurant featuring fish and seafood, or relax at the Il Nettuno beach club. If you are still keen to see the sights of Anacapri, when you head back to town from the Blue Grotto, park your scooter in the piazzetta di Orrico area (you'll recognize it by the large stone tablet), and visit another defensive fort or the Damecuta archaeological site, remains of one of the twelve villas built by the Roman emperor Tiberius.